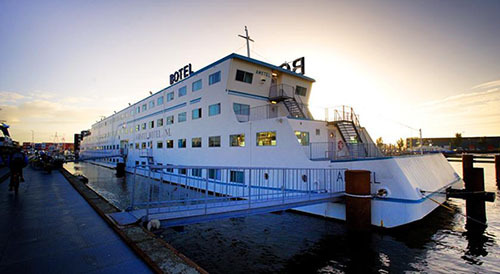 A hotel on a boat or a party hotel? Or do you prefer a quiet, romantic hotel to spend a few nice days with your sweetheart? On this page you’ll find our suggestions for cheap hotels that still bring a lot of fun. Way to far from the center, poky room, bad breakfast – cheap hotels in Amsterdam with a good price-performance-ratio are not that easy to find. Visitors from all over the world flock to the beautiful canal city and the hotels are well booked over the entire year. Hotels that aren’t located directly in the center (e.g. the Meininger Hotel or the Botel), are often a little bit cheaper. Most of the time, you just have to go 10-15 minutes by train or ferry and at the same time you can save a lot of money. In comparison to other cities, the price level is relatively high. Nevertheless, with our tips and a little bit of luck you can get a neat hotel room starting from 80€ per night. The prices apply to double rooms. So if you come as a pair, everyone pays approximately 40€. 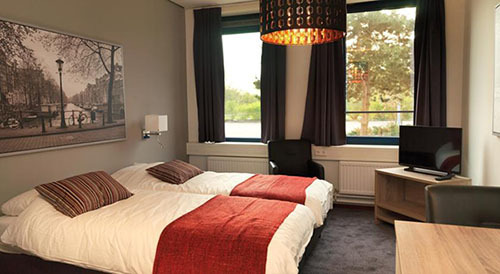 The Teleport Hotel is located in Westpoort, not far from the Sloterdijk train station. Here, you’ll not stay directly in the center, but the transport connection is superb. The train departs every 9 minutes from the main station and takes approximately 6 minutes (see timetable here). Friendly service, generous room, cozy beds and a delicious breakfast leave nothing to be desired. On top of that, the whole Hotel provides free Wi-Fi and even a small kitchen nook with coffee maker in every room. 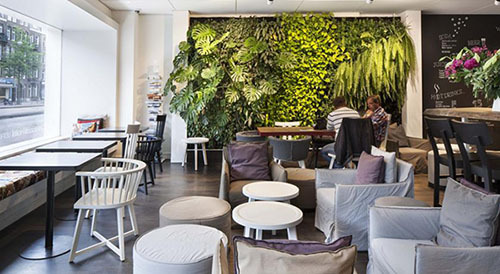 In the Amsterdam Teleport Hotel you’ll immediately feel at home. Borrow a bike directly from the hotel. The drive to the center takes only about 10 to 15 minutes and it is so much fun to bike in Amsterdam! Since the Teleport Hotel is located out-of-town, the room prices are a little bit more favorable – a hotel with excellent price-performance ratio. You can get a room starting from 80€. 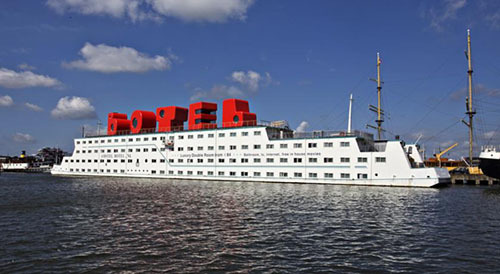 The Botel is a floating hotel on a boat in the center of Amsterdam. The location is especially cool – the Botel anchors directly in front of the terrain of the trendy NDSM wharf. From central station you can ferry over to the Botel with the free ferry in about 10 minutes. The passage is really beautiful (here a You-Tube-Video). 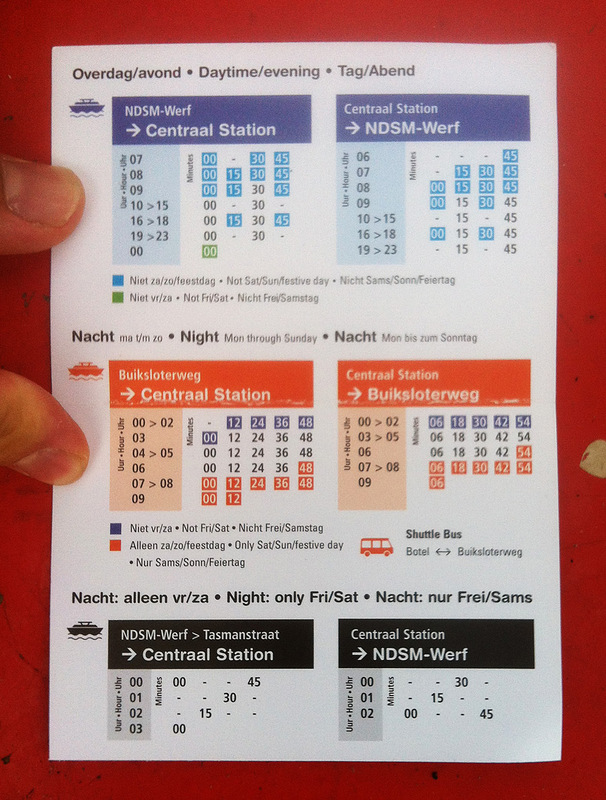 The ferry to the Botel goes approximately every 15 minutes, even at night (here you can find the timetable). The rooms in the Botel are plain, relatively small, but very clean and quiet. Besides single and double rooms, there are also triple rooms with a bunk bed. This will make everything again a little bit cheaper. Depending on the season, a room starts at approximately 85€ (incl. breakfast). In the mornings there’s a delicious breakfast buffet with everything that comes with that. Further conveniences in the floating hotel are the deck with a great view, a well-stocked bar, free Wi-Fi and much more. For this price, there’s nothing to complain about. Central location and a fair price – this combination is very rare in Amsterdam. 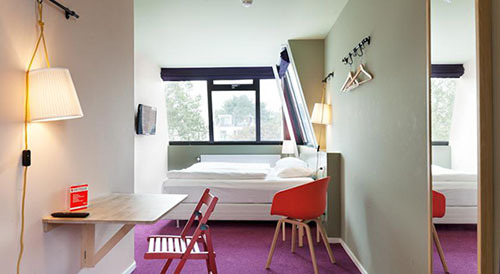 Exactly that offers the ibis Amsterdam Centre. A solid 3 star hotel with little weaknesses. You should not expect too much from the Ibis Hotel. The rooms are small, the quality of service is okay and the (delicious) breakfast a little bit expensive with 17€. 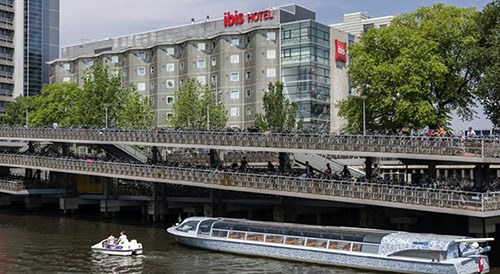 If you’re on your way in the city all day long and you search for cheap hotels in Amsterdam for one or two nights, we can absolutely recommend ibis Hotel. After arrival, ask on the reception desk if you can get a room on the upper floors. The view over the historical center of Amsterdam is amazing! The location, directly at the central station, is really great. You just have to cross the big crossroad in front of the station and you’re already in the historic city. A room starts at 120€. You’d like to give a bachelor party or you just like a change around you? Then you’re right in the Winston. A Club belongs to the hotel, where every evening well-known DJs and Bands play – perfect for partying. Always true to the motto „Party Hard, Sleep Easy in Amsterdam“, you can directly jump from your bed into the lively streets of the center. 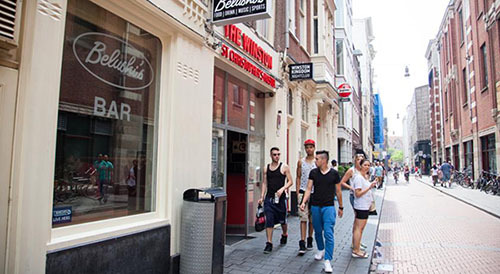 The St. Christophers lies in the Red-Light District, directly in the heart of Amsterdam. In the evening, the hotel turns into a big party. Besides the cheap multi-bed rooms, there are 60 design rooms that all have been designed by different artists – every single one is unique. The rooms are very clean, the breakfast is excellent and the hotel’s own security ensures safety. If we would have to describe the Meininger Hotel in only three words, it would be the following: bright, friendly, cheap. 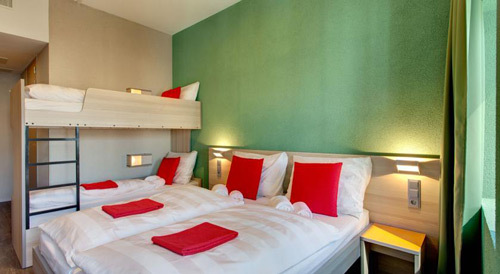 The Meininger Hotel lies directly at the Sloterdijk train station. Since it’s located a little bit out-of-town, the price-performance-ratio is really first class. All 9 minutes a train leaves. In only about 6 minutes you’re at the main station. The journey to the airport takes only about 15 minutes. Here is the timetable. From the train station Sloterdijk you can reach the train to the famous beach resort Zandvoort in only 30 minutes. This is perfect to spend a relaxing day on the beach. As a very good Budget Hotel, the Meininger Hotel Amsterdam City West already received several awards for cleanliness and top service. The bright and friendly designed rooms offer free Wi-Fi and a flat screen TV. Especially interesting for groups and families: There are also rooms for 3, 4 or 6 persons. A double room costs about 75€. 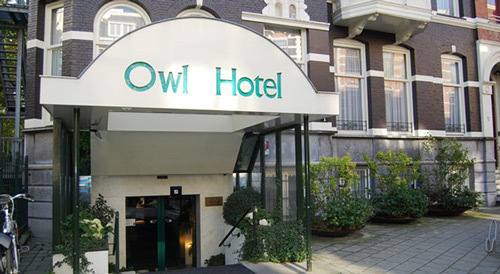 The traditional Owl Hotel convinces with its superb location in the museum district, between Leidesplein and Vondelpark. The Vondelpark is one of the most beautiful parks in Amsterdam. Here you can relax while strolling through the park or just by stretching out a blanked on a pond. In the evening, the Leidesplein, with its many bars and restaurants, is perfect for a discovery tour. If you come by plane, drive from the Schipol airport with the Amsterdam Airport Express (Bus line 197). This one departs every 15 minutes from platform B9. This is much faster (approximately 30 min.) and cheaper (4€) than by train. You have to get off at the station Leidesplein. From there you only have to walk about 5 minutes until you reach the Owl Hotel. Behind the house there is a lovely small garden. Guests of the Owl Hotel Hotel especially praise the super friendly staff and the flawless cleanliness in the rooms. It’s not natural for cheap hotels in Amsterdam. It’s always good to be nice to our environment. In the classy atmosphere of the Conscious Hotel you can stay overnight in an ecologically meaningful way. We especially like the pragmatic implementation of the concept, without the moral pointing finger and muesli image. All the electricity of the hotel is acquired by renewable energy sources and the tables are made of recycled yoghurt pots. The motto of the owners: You can also do good by looking good – very likeable. The Conscious Hotel lies quietly and directly at the beautiful Vondelpark. All rooms are bright and friendly designed. Rooms that look onto the road are a little bit loud. The breakfast is delicious. The kitchen in general serves a lot of local specialties in first-class quality. You can get a double room starting from 130€. Lean back in an armchair in the state parlor and enjoy the view of the canals. In Hotel Wiechmann, you directly feel relegated into the golden age of the old Amsterdam. The location in the Prinsengracht, the beautiful Jordaan-Viertel, is really spectacular. Especially late at night, when the old canal houses are lit up and the tourists are gone, there is a unique mood. 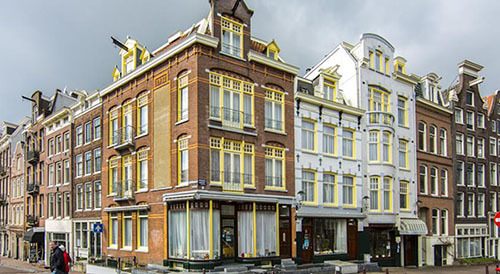 At the Wiechmann Hotel, you live in 3 kindly restored, historic canal houses. The interior mainly consists of antique furniture. Of course you don’t have to renounce on contemporary conveniences such as Wi-Fi and modern bathrooms. The simple but delicious breakfast is served in the cozy lounge overlooking the street and the canal. A double room at the Wiechmann costs about 140€. Rooms with an overview over the canals are a little bit more expensive. 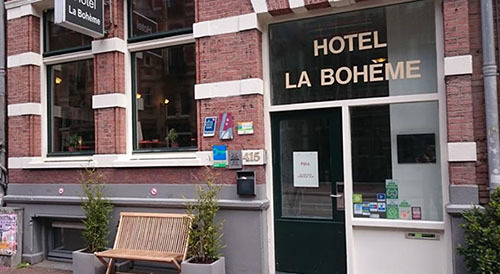 Small, friendly, cheap – the Hotel La Boheme lies in the south of Amsterdam. You’ll find legendary clubs, like the Melkweg and the lively Leidesplein within a walking distance, but also a lot of quiet corners like the Vondelpark and the Museums-Quartier. The location is ideal to explore the city on foot or by bike. The rooms are relatively small, but very clean and beautifully furnished; as it is right and prober for a hotel in Amsterdam. The beds are so comfortable, that you likely might keep on sleeping in the mornings. The very sympathetic staff, that patiently answers all questions and lends their support to the guests with helpful tips, provides a friendly atmosphere. The Hotel cat Mimi is especially cute. The La Boheme Hotel really offers a great price-performance ratio, considering the excellent location. You can get a double room starting from 95€. With this charming hotel, you can’t go wrong. Beautiful rooms in the style of Amsterdam with a welcoming atmosphere and a super location make the Neighbour’s Magnolia one of our top suggestions for cheap hotels in Amsterdam. The Magnolia is situated in the popular south of Amsterdam. You only have a few meters to Vondelpark and there’s a tram station directly in front of the door. Quiet and still central, the hotel is perfect to spend a few nice days with your sweetheart. For a hotel in Amsterdam, the rooms are comparatively big and very nicely furnished. The friendly stuff does everything necessary for you to feel at home right after your arrival and prepares the simple but yet very delicious breakfast. For that much love for detail, the price of approximately 90€ for a double room is more than fair. On this page there are partner links (affiliate links). If you book via a partner link (or if you buy something), we get a small commission. These commissions help us to keep this site up and running. You don’t pay a cent more. We take you to the most beautiful places in Amsterdam.